Length of Trail: 4 miles of trail with amazing views of the Ramona valley. Staging Area: The staging area is located on 1500 Deviney Lane/San Vicente Road in Ramona. 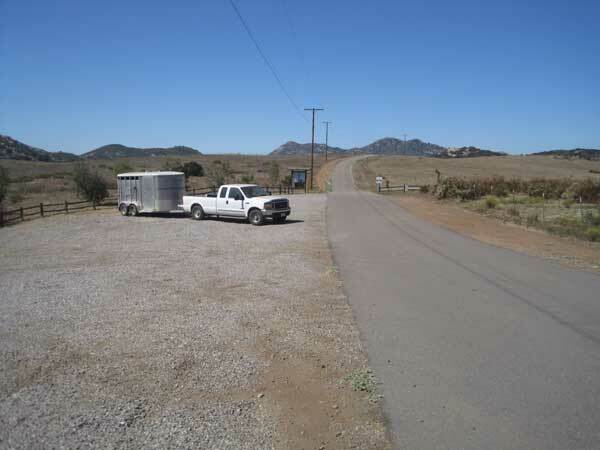 There is a long, narrow parking lot with space for several trailers. You may need to back your trailer into a parking space. Directions: From Highway 67, make a right on San Vicente/10th Street. Turn right on Deviney Lane into staging area. Water: There is a water trough at the staging area which is filled periodically. 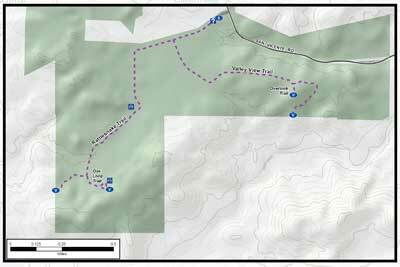 Trail Conditions: There are two out and back trails and one loop trail. The trails are relatively flat and easy to navigate. There are a couple of picnic areas with picnic tables along the trail. General Trail Info: The preserve is open 8 am to sunset daily. From San Diego County website: The 728-acre Barnett Ranch preserve consists of high value natural communities – southern coast live oak riparian forest, southern willow scrub, freshwater seep, riparian scrub, open water, open Engelmann oak woodland, coast live oak woodland, wildflower field, Diegan coastal sage scrub, coastal sage-chaparral scrub, southern mixed chaparral and non-native grassland. These vegetation communities support several sensitive species including southern California rufous-crowned sparrow, loggerhead shrike, white- tailed kite and orange-throated whiptail.